We had two engines at So. Anderson that were hard steamers and would give a fireman fits trying to keep them hot. The 2111 had a problem that was caused by plugged flues and front end screen. We are going to tell about the 2268 an H-10b. The 2268 was a normal H-10 until you started down the road and she lived up to her reputation. Everyone had trouble and failures firing the 2268 except one man and after he told me how, there were two. One day in Sept. 1950 I was firing on # 71, the South Anderson to Jeffersonville Indiana morning freight with engine 2268 as power. Before we left So.Anderson and while talking with the engineer, Bob Snowden, known as Snowball, that this engine was a hard steamer. Snowball said he had heard some firemen say this but his fireman Sam never had any trouble and everything would be ok. I had been working a little over a month at this time. Well, about 3 hours later on a 1 hour and 35 minute run we arrived at Greensburg. The H-10 had the big tender that held 15000 gallons of water and 22 tons of coal. About 19 tons had gone through the firebox and we had stopped 4 or 5 times to get the steam pressure up. After taking coal and water, our train was small enough that we were able to make the trip to Jeffersonville. About a week later I was called for a Claypool Turn with 50 cars of coal. The engineer was Snowball's regular fireman Sam. The engine was the 2268. Sam was an excellent fireman and a very good engineer. If it had a boiler and a place for a fire, Sam could make it steam. Of course my first question for Sam was, "Snowball said you could make this engine steam and no one else on the division could. Would you tell me how you do it?" Sam chuckled and said, "With this train, I had better help you. Roll in a big heel and we will go from there." With the stoker and shovel, I put a good heel in the firebox. I asked Sam how the heel looked. "It's not big enough. Put a heel in like you would when you hand fired an H-5, except in front of the distributing plate." After getting the fire ready we left the enginehouse, coupled onto the train and headed for Claypool. Leaving the White River valley at North Anderson is a pretty good pull and the 2268 performed just like an engine should. I was amazed at how the engine steamed and I could have made the pop valves open anytime I wanted. On the Michigan Branch most of the towns are located near small streams and this made your stops down hill and always a pull out of town. The next test would be leaving Marion. Leaving town you start up a gentle slope for half a mile that steepens into almost a 2% grade with a reverse curve to the top. The engine would slow down to ten or twelve mph and with the reverse almost in the corner the engine steamed perfectly. The yard engine gave us a shove at Wabash because of the 2% grade and on to Claypool without any trouble. 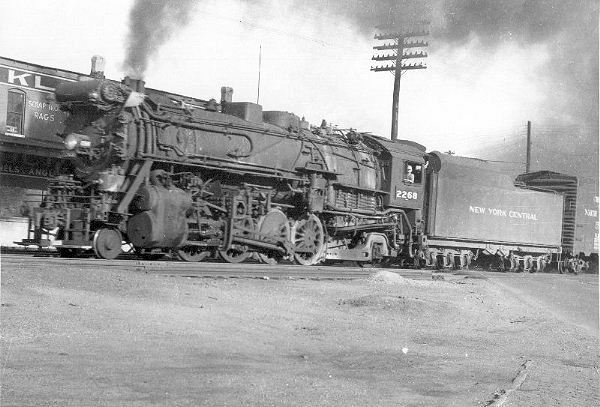 Now this is the same engine that a week before I could not keep steam on and used 20 tons of coal to go 56 miles. I fired this engine several times using Sam's method and never had a minutes trouble. I told other fireman about this firing style and they would shake their heads and say, "Well, I don't know." So, you just sit back and smile and listen to the troubles they have firing the 2268, knowing two fireman that never had any trouble. All photos are from the Ted Tobin Collection.